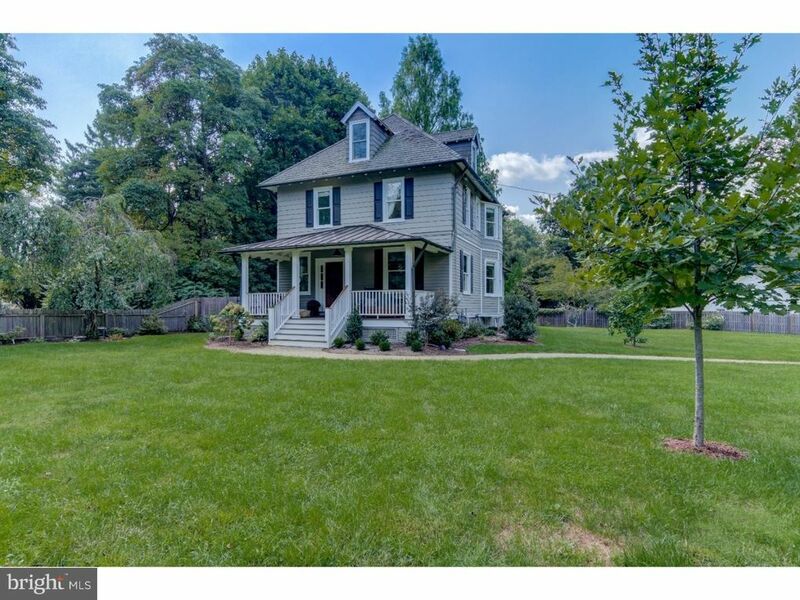 A large covered front porch provides an inviting entry to this classic foursquare style farmhouse in sought-after Wayne. This 4 BD, 2.5 BA colonial has been completely updated, and offers an appealing combination of historic charm and modern amenities. Beautifully renovated just over a decade ago, this home features a renovated Kitchen, renovated Bathrooms, 9 ft. ceilings, gleaming wood floors, neutral painted walls, and enhanced trimwork. Large Entrance Foyer with vintage glass doors to the expansive Living Room, which is completely open to the Dining Room, offering the open concept lifestyle that is so popular with today's buyers. The Kitchen has cherry cabinets, tumbled marble backsplash, granite counters, GE Profile stainless gas range, new GE stainless microwave, Fisher and Paykel stainless refrigerator, and a stainless dishwasher. The island has 2 pendant lights and space for barstool seating. A carpeted Family Room, tiled Laundry/Mudroom, and Powder Room complete the 1st floor. Stained glass windows and vintage millwork accent the stairwell. The 2nd floor has a large Master Bedroom with 2 closets, 2 more bedrooms and a renovated Hall Bathroom. The 3rd floor features a large Master Bedroom with en suite 2nd Full Bathroom, vaulted ceilings with distinctive exposed beams, and built-in cabinets with storage drawers. The front porch has room for multiple seating areas and was rebuilt with low maintenance railings, new metal seam roof, and beautiful Brazilian hardwood (ipe) decking (2016). New natural gas high-end heater (2015). The scenic .72 ac. partially-fenced property is level and has been extensively re-landscaped. It offers ample space for recreation, gardening, and future expansion. The side yard is fully fenced with a door to the Mudroom (ideal for containing pets) and a Shed provides additional storage. Driveway parking for 6 vehicles. Davis Lane is a no-thru-traffic, private street. Year-round events foster a strong sense of community in this quiet neighborhood. Located in top-ranked Tredyffrin-Easttown School District, this home is convenient to train stations, shopping, corporate centers, Center City, Airport and major highways. Don't miss this charming old house with loads of new house features!